On December 21, 2017, CISDSU hosted an annual holiday gathering at the Six Arts Center. Local Chinese artist Mr. Kegong Li was invited to demonstrate the beauty of Chinese painting. At the event, SDSU professors, CI Hanban teachers and staff members, Friends and guests had the opportunity to interact with Mr. Li and tried Chinese brush painting for the first time. After the demonstration, a reception was held provided with holiday gifts and a variety of foods and desserts. Guests gathered to enjoy the holiday spirit and celebrated the end of the year together. On December 17, 2017, CISDSU attended the Four Treasures of the Chinese Study Closing Reception at San Diego Chines Historical Museum. The Four Treasures of the Chinese Study Exhibit was collaboration between CISDSU and SDCHM. During the reception, Dr. Ruan Daren gave a lecture about traditional Chinese Calligraphy. His speech was interpreted by Dr. Lilly Cheng, Managing Director of CISDSU. At the reception, CISDSU Six Arts Instructure Ms. Dan Liu performed traditional Chinese instrument – Guzheng, which attracted guests to listen and enjoy the charm of Chinese music. On December 12th- 13th, the 12th Confucius Institute Conference was held in Xi’an, China. This year’s theme focuses on “Deepen Cooperation, Developing through Innovation, Working Together to Build a Community of Shared Future for Mankind”. 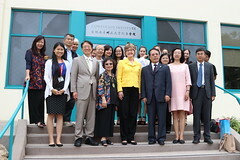 San Diego State University Provost Emerita Dr. Nancy Marlin, CISDSU Managing Director Dr. Lilly Cheng, Co-Director Professor Cunlu Zhang participated in the conference. 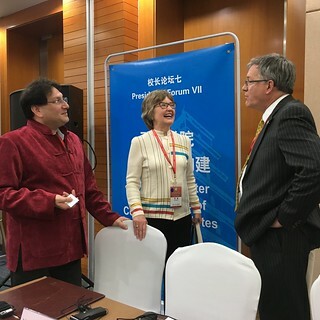 On behalf of CISDSU, Dr. Nancy Marlin addressed a speech on the topic of “Building a Better Public Image of Confucius Institute” at the Presidents’ Forum. She said public image can be built through internal university events, collaboration with community organizations, involvement in exciting multicultural activities and sponsor large public events and celebrations. CISDSU aims to develop innovative curriculum to expand the Six Arts in Confucius Classroom schools and community. This will be our continuous efforts in the years to come. On the 9th Xiamen University Confucius Institute Partnership Workshop, the Confucius Institute at San Diego State University (CISDSU) was awarded “The XMU 2017 Confucius Institute of the Year”. 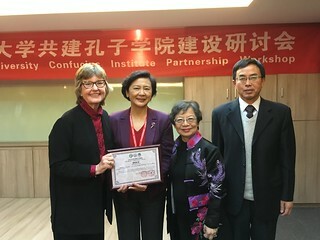 Xiamen University Vice President Xinli Zhan presented the award to SDSU Provost Emerita Dr. Nancy Marlin, CISDSU Managing Director Dr. Lilly Cheng and Co-Director Professor Cunlu Zhang. The workshop was held on December 11th in Xi’an City, Shaanxi Province. Dr. Nancy Marlin was invited to speak during the workshop. The Partnership Workshop is a meeting to share experience and enable engagement at a deeper level for all the partner universities. On December 12th to 13th, CISDSU will participate in the 12th Confucius Institute Conference hosted by the Confucius Institute Headquarters. On Saturday, November 18, the Confucius Institute at San Diego State University (CISDSU) hosted its first Youth Chinese Test (YCT) at the Language Acquisition Resource Center (LARC) on SDSU campus. Confucius Classroom students from Pacific Beach Middle School participated in this test. YCT is an international standardized Chinese language test which is directed at examining non-native primary and secondary school students’ ability to apply Chinese language in their studies and daily lives. 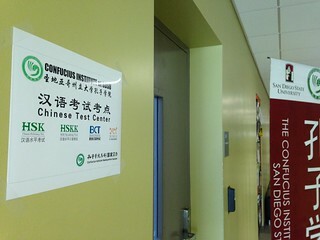 Please follow our website http://confucius.sdsu.edu/courses.html for future testing schedules. On Thursday, November 16, CISDSU participated in the 2017 International Peace Village at Montezuma Hall on SDSU campus. Project Coordinator Chudan Li, Six Arts Instructors Dan Liu and Rensong Li, and intern Frida Niebla hosted a table at the Peace Village to introduce Chinese music, martial art, as well as the 2018 Shanghai Summer Program. On stage, Dan Liu and Rensong Li together performed Taichi Sword and Guzheng instrument, which won a big round of applause from the audience. 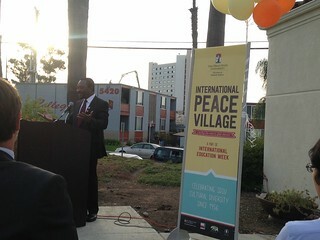 The International Peace Village was part of the International Education Week celebration on campus. 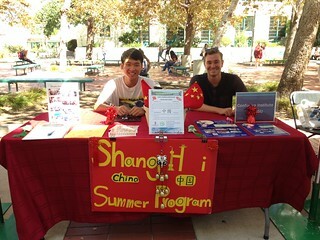 CISDSU attends the event each year to support International Education and also to promote Chinese language and culture on campus. 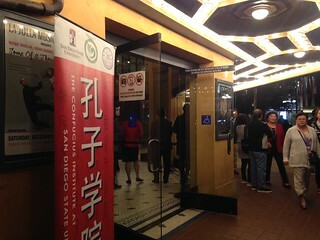 On the evening of November 14, 2017, around two hundred friends, alumni, students, teachers and staff of the Confucius Institute at San Diego State University (CISDSU) gathered at the historic Balboa Theater, waiting for the exciting performance program “Experience China 2017: A Glimpse of West China” to begin. This program was hosted by the State Council Information Office of China, and the Consulate General of China in Los Angeles, performed by the Gansu Provincial Ethnic Song and Dance Troupe of China. The performances consisted of Han, Hui, Tibetan, Mongolian, Dongxiang, Yugu, Bao’an and Man ethnic songs, dances and instruments from China’ western region. Audiences were impressed by the diverse culture in western China. They appreciated the opportunity of having a “glimpse of west china” through watching the performances. On Tuesday, November 14, the Confucius Institute at San Diego State University (CISDSU) hosted a traditional Chinese tea ceremony performance at the Six Arts Center on SDSU campus. Managing Director of CISDSU, Dr. Lilly Cheng, hosted the event. CISDSU project coordinator Jason Huang and instructor Dan Liu performed Chinese tea ceremony and Guzheng instrument music. The tea ceremony was part of the International Education Week celebration event on campus. 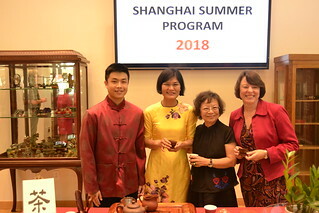 After the tea ceremony, CISDSU project coordinator Chudan Li introduced the 2018 Shanghai Summer Program. She also invited students from the previous program, Eric Ho and Charmagne Jones, to speak about their experiences participating in the program. Many students are interested in the program and they appreciated the efforts of CISDSU for organizing this important study abroad opportunity. On Monday, November 13, the Confucius Institute at San Diego State University (CISDSU) participated in the International Education Week Opening Ceremony hosted by the International Student Center (ISC). CISDSU project coordinators, Chudan Li, Muting Huang and Yueying Zhan attended the event. ISC Director Noah Hansen welcomed the guests and announced the opening of the annual International Education Week Celebration at SDSU. SDSU provost Chukuka Enwemeka addressed a speech on the importance of international education for SDSU. SDSU has moved up to 8th among all U.S. universities for the number of students study abroad. Provost Enwemeka appreciated ISD and many campus organizations for working together to promote international education. CISDSU as one of the organizations on campus being involved in the International Education Week Celebration, will host Chinese Tea Ceremony, Chinese Taichi Sword, Chinese musical instrument performances on campus at various events. Please follow our website http://confucius.sdsu.edu/events.html for more upcoming events. 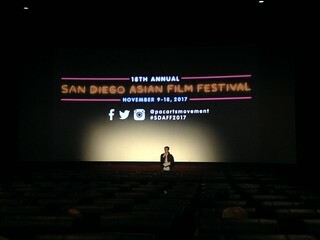 On November 13, 2017, the Confucius Institute at San Diego State University (CISDSU) co-presented the movie Our Time Will Come at the 2017 San Diego Asian Film Festival. The movie was played at the Mission Valley UltraStar Theater. CISDSU staff members participated in the movie screening to support the event. CISDSU’s sponsorship was to support the film festival as well as to promote Asian/Chinese culture and awareness to the public. On November 11, CISDSU hosted the 1st HSK Exam event at San Diego State University Language Acquisition Resource Center (LARC). A total of 12 participants were present to participate in the HSK exam. The HSK exam is an international standardized test that assesses Chinese language proficiency of non-native Chinese learners. The HSK levels tested ranged from 1-6. The event turned out a success and students were appreciative for having the opportunity to test their Chinese language skills for official certification. The YCT Exam event for youth learning Chinese will be hosted on Saturday, November 18 at SDSU. We plan to host our 2nd HSK/YCT Exam event at SDSU on a future date during the upcoming Spring semester. Stay tuned for more information on future events hosted by CISDSU. On November 6, 2017, CISDSU Co-Director Professor Cunlu Zhang and Project Manager Ms. Anne Chu visited Confucius Classroom School Fletcher Elementary School with Six Arts instructors Dan Liu and Rensong Liu. The visit included meetings with school principal, administrators, teachers and Hanban teachers. At the meetings, Ms. Chu also presented information about the 2018 Chinese Bridge Competition. She encouraged students to participate in the upcoming competition. 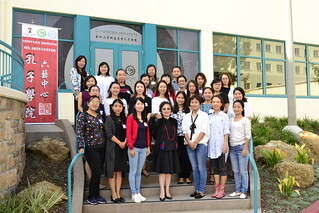 On November 5 Confucius Institute hosted the November Teacher training for Hanban teachers at the Six Arts Center at San Diego State University (SDSU). The event attendance included about 34 Chinese teachers from multiple Confucius classrooms around San Diego. The teacher training invited special guest speakers to talk about different topics pertaining to English-Chinese language training. The first guest speaker was Kenneth Tom who covered English Phonology with the teachers. The teachers actively mimicked Kenneth’s phonology examples in hopes of “moving towards more native-like spoken English”. Next Tom Hom, previous San Diego city councilmen and author of his book “Rabbit on a Bumpy Road”, talked about his life experiences that led to his story of courage and endurance. Lastly Sally Lowe, Chinese teacher at Barnard Asian Pacific Language Academy, talked about techniques that teachers can utilize to integrate language and science within their Chinese immersion classroom. Last but not least, Anne Chu, Confucius Classroom program manager, shared how to explore the search for “Super Star” students with the teachers. She talked about how to look for high-potential students in terms of Chinese learning at school. Next, Anne shared her experience of developing talents among these students. In addition, we also announced that the Chinese Bridge competition will be held on March 2018 and introduced the rules of the competition so teachers can save the date and look for students who are interested in this competition. The teacher training turned out a success and we look forward to hosting our next Hanban teacher training. From October 13th to 29th, 2017, the 10th Chinese Proficiency Competition for Foreign Secondary School Students was held in Kunming, China. Charlie Hoffs (江明晰), screened by the Confucius Institute at San Diego State University (CISDSU), from Laguna Beach High School and Kaylee Doty (黃秋月) form Sacramento teamed up as U.S.A. Team 3 to compete with other students from other countries. There were over 100 contestants from 96 countries came to China for this competition. After the fiercely competitive competition, U.S.A. Team 3, led by Mu-Ting Huang, CISDSU coordinator and adviser of the students, won the championship of the 10th Chinese Proficiency Competition. This two-week program started from Beijing where students visited many historical sites such as the Great Wall, Forbidden City and Summer Palace. Students were very excited to climb the Great Wall and also to see the place where the Chinese emperor lived and worked. Students also got the chance to visit the Confucius Institute Headquarter in Beijing which has a cultural experience center and where students tried a variety of traditional Chinese cultural activities such as Calligraphy, Chinese musical instrument and artifacts, and Peking opera outfits. Students then went to Kunming for the competition. The competition had five rounds. If contestants pass the first three rounds, they can move on to the top 20 as teams. The first three rounds were a Speech, a talent performance and a written test. Students who were promoted would move to the second two round in which students worked in teams of two. In the fourth round, students collaborated to finish a variety of games related to Chinese culture in three stations. At the stations, students were given Chinese idioms and ancient poems, which were not in correct orders, and then they needed to fill in the missing characters and arranged the lines of poem in the right order. The students who got promoted to the fifth round teamed up with local students to accomplish different assigned tasks. Our team went through the “Bridge-Crossing contest” which is the first, second and third round, and passed the fourth round into the final round. In the final round, there are five teams which represent each continent compete for the championship. Students in each team were asked to do a role play of a Chinese role in “The Romance of the Three Kingdoms and then do a speech, “Me and the Chinese Bridge competition.” Charlie and Kaylee defeated other teams and won the championship. In addition to the competition, students went to many famous sight-seeing spots in Yunnan and visited two local Chinese families. For example, students went to the Stone Forest where the many tall rocks which create the illusion of a forest made of stone. Students went to the host family’s house to interact with local high school students, to taste the authentic local meals and to practice Chinese. Moreover, students attended the classes that were taught at the University. The classes: paper cutting, calligraphy, tea ceremony and archery, were also related to the Chinese Six Arts culture. This two week program was just a glimpse of one of the largest countries in the world. At the end of the program, the students expressed gratitude for the opportunity to experience such a wonderful cities and such wonderful culture. On October 18, 2017, a delegation from Shandong Province, China visited Six Arts Center at SDSU and participated in the Shenmo Abacus Exhibition Opening. The delegation included Vice Chairman of the Shandong Committee of the China Zhi Gong Party, Ms. Jiang Ming; Director of Chinese Overseas Friendship Association of Shandong Province, Mr. Xing Weigong; Vice Chairman of the Yantai Committee of the China Zhi Gong Party, Mr. Tang Zhenduo; Chairman of the Fifth branch of the Shandong Committee of the China Zhi Gong Party, Mr. Hu Jianhong; Vice Chairman of the First branch of the Shandong Committee of the China Zhi Gong Party, Mr. Yu daqing; a member of the China Zhi Gong Party, Mr. Wang Xinyuan. A welcoming ceremony with the traditional Guzheng instrument and a Martial Arts performance was held at the opening reception. Managing Director of CISDSU Dr. Lilly Cheng and Ms. Jiang Ming together cut the red ribbon to announce the official opening of Shenmo Abacus Exhibition. The Exhibition showcases a collection of abacuses from China, as well as the teaching of using abacus and mental abacus. In the morning, the delegation visited Confucius Classroom School Barnard Asian Pacific Language Academy, where they observed the abacus class as part of the Six Arts Program launched by CISDSU in October, 2016. In the evening of October 16, 2017, the Six Arts Center welcomed about 30 SDSU Arts and Letters professors and alumni for the event “Greet the Professor Wine and Beer Social”. Faculty of the College Arts and Letters, including Norma Bouchard (Dean of Arts and Letters), Ed Beasley (History), Audrey Beck (Sociology),Matías Beverinotti (new faculty in Spanish and Portuguese) Fred Conway (Anthropology), Sarah Elkind (History),Eve Kornfeld (History), Walter Penrose (History), and Erika Robb Larkins (new Director of the Brazil Program and in faculty in Anthropology and Sociology), participated and supported the event. On October 14, 2017, San Diego Chinese Historical Museum (SDCHM) and CISDSU successfully co-hosted the opening reception for the museum’s new exhibition: Four Treasures of the Chinese Study. Over 250 participants attended the event. It was the biggest attendance since the museum established. Current museum Executive Director, Brandon Horrocks, welcomed the guests; followed by Museum Board Chair Michael Yee introducing board members. The event was hosted by Polly Liew, member of Board of Directors. At the event, guests enjoyed the display of China’s Four Treasures: Brush, Ink, Rice Paper and Inkstone. 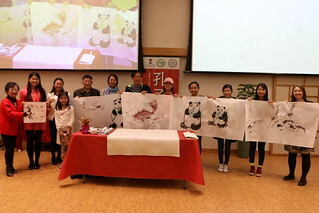 Local artists also supported the event and provided their Chinese calligraphy and painting for display. 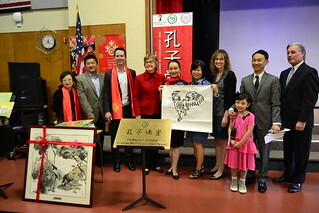 The displayed of the Four Treasures was sponsored by The Confucius Institute at San Diego State University. The Museum invited guest artists, Check Ng and Yuen Chik Tam to demonstrate calligraphy and ink painting. Artist Lily Yu also demonstrated Chop engraving. Confucius Institute instructor Ms. Dan Liu gracefully performed Chinese traditional instrument – Guzheng, which attracted hundreds of audience. On Saturday, September 23, Confucius Institute at San Diego State University and House of China co-hosted the 2017 Moon Festival Celebration. This is the third year that the two institutions have hosted the celebration in San Diego, which has become one of the biggest events of the city at the historical Organ Pavilion at Balboa Park. More than seven thousand locals and tourists crowded the audience section, eagerly waiting for the show to begin. The evening started off with a powerful drum dance performed by San Diego Korean Pungmul Institute. Next, the Xiamen University Arts Troupe amazed the audience with their graceful dances, singing, and traditional Chinese instruments throughout the evening. 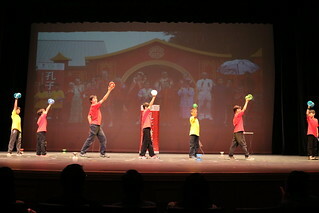 Elements of the Six Arts were demonstrated to the audience by Confucius Classroom teachers and students. They were featured in Peking Opera: “The Drunken Beauty”, “The Magic of Abacus”, “Tibetan Blue” (dance), “The Land of Li” (Han Dynasty dance), Chinese Yo-Yo, and Chinese sign language. Emcees for the evening were Micheal Chen from 10 News, and Christopher Santy and Leah Markworth from Pacific Beach Middle School. The evening ended with a spectacular dragon and lion dance presented by Three Treasures, Chinese Consolidated Benevolent Association, and Southern Sea Lion dance team. Dignitaries in attendance included Chief of Staff of San Diego County Supervisor Ron Roberts Salvatore Giametta, Congressman Scott Peters, Representative Howard Ou, Mayor Kevin Faulconer, Representative John Ly, Xiamen University Vice President Dr. Daguang Wu, San Diego Unified School District Board Trustee Michael McQuary, and several school administrators from Confucius Classroom schools. 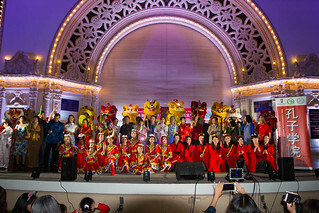 The 2017 Moon Festival Celebration in Balboa Park was presented by performers and enjoyed by audiences from many walks of life. On September 22, Xiamen University Arts Troupe brought a spectacular performance to Riverview International Academy. The Confucius Classroom school enjoyed a wonderful display of Chinese dance, music, instrument, and calligraphy. 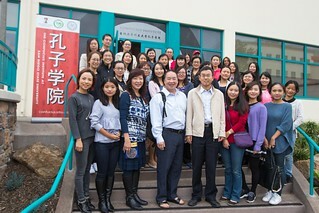 The event was hosted by the Confucius Institute at San Diego State University and took place at the Riverview auditorium. Riverview International Academy Principal Dr. Brian Thurman welcomed the delegation. Managing Director of CISDSU Dr. Lilly Cheng served as the emcee of program. Over 200 students and teachers watched the performance. After the performance, a reception was held at the school. Principal Thurman expressed his appreciation to Xiamen University for bringing such exciting and culturally enriching experiences to the school. In the evening of September 21, the Confucius Institute at San Diego State University and Friends of CI hosted an official welcome banquet for the Xiamen University delegation. Xiamen University (XMU) Vice President Dr. Daguang Wu, Council Chair of Southern Base of Confucius Institute Headquarters Madam Li Fan, Section Chief of Southern Base of Confucius Institute Headquarters Ms. Dongmei He and 8 performers from the Xiamen University Arts Troupe joined the dinner at Golden City Restaurant. The highlight of the banquet was performances brought by Xiamen University Arts Troupe and Chinese Bridge Competition Champion Leah Markworth. Leah showcased her excellent Chinese proficiency skills by singing the Chinese song “Grandmother’s Penghu Bay” and recited a Chinese poem “Prelude to Water Melody” (水调歌头). Xiamen University musicians Yi Xingjun and Yang Haichuan performed Erhu and Bamboo flute. Soprano singer Wang Mengyang also sang a song called “Back to Lhasa”. The banquet was hosted by CISDSU Managing Director Dr. Lilly Cheng. San Diego Unified School District Board Trustee Michael McQuary, Adobe Bluffs Elementary School Principal Edward Park, Riverview International Academy Principal Brian Thurman, Xiamen University and SDSU Alumni Professor John Cleary, and Friends of CI members Anne Rosser, Caroline Chinn, Sharon Garuba, and Siu-Fong Evans also attended the banquet. In the afternoon of September 21, the World Teachers’ Day Celebrating Confucius’ birthday was held at the Six Arts Center. The event was sponsored by the SDSU Confucius Institute, Center for Asian & Pacific Studies and Department of Women’s Studies. This year’s theme was “A Salute to Women Teachers”. Guest lecturers of events were Managing Director of CISDSU Dr. Lilly Cheng, Director of SDSU Center for Asian-Pacific Studies Sandra Wawrytko, and Chair of SDSU Department of Women’s Studies Doreen Mattingly. To celebrate Confucius’ birthday, an unveiling ceremony of the Confucius statue was held at the Center. Dr. Cheng hosted the ceremony and presented the topic “The Mothers who Taught Confucius and Mencius”. Special performance was featured by Xiamen University Arts Troupe. They demonstrated music, dance and calligraphy in a performance called “Dance to the Music Along the Silk Road”. Xiamen University Vice President Dr. Daguang Wu was present to support the event. On September 21, the Confucius Institute at San Diego State University (SDSU) invited Xiamen University Arts Truope to perform on SDSU campus. The program, called “Dance to the Music Along the Silk Road”, a featured music, dance and calligraphy. Professor Khaleel Mohammed of SDSU Department of Religious Studies, Xiamen University Vice President Dr. Daguang Wu, Council Chair of Southern Base of Confucius Institute Headquarters Ms. Li Fan, Section Chief of Southern Base of Confucius Institute Headquarters Ms. Dongmei He, CISDSU Managing Director, Dr. Lilly Cheng and staff members attended the performance. More than 300 students participated in the event. To begin the performance, Dr. Cheng gave a lecture on the history of the Silk Road. She explained that the Silk Road is known for exchanging goods, cultures, music, dance, religions and languages from China to other parts of the world. Islamism, Buddhism and Christianity were all brought into China through both the Land Silk Roads and the Maritime Silk Roads. At the end of the performance, students had the opportunity to learn calligraphy and how to play the Erhu instrument from the performers. The event not only enhanced SDSU students’ understanding of Chinese culture, but also provided a unique opportunity for the students to learn about the Chinese arts. 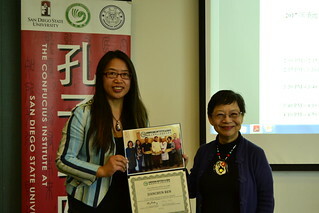 After the lecture, an appreciation certificate was presented Vice President Dr. Daguang Wu. Professor Mohammed expressed his special thanks to Xiamen University and CISDSU for their ongoing efforts of bringing cultural learning opportunities to the SDSU campus. On Thursday, September 21, a ribbon cutting ceremony was held at the Six Arts Center at San Diego State University (SDSU). Taking part in the ribbon cutting ceremony were SDSU Provost Emerita Dr. Nancy Marlin and Xiamen University (XMU) Vice President Dr. Daguang Wu, Council Chair of Southern Base of Confucius Institute Headquarters Madam Li Fan, Section Chief of Southern Base of Confucius Institute Headquarters Ms. Dongmei He, Managing Director of the Confucius Institute Dr. Lilly Cheng, Co-Director Professor Cunlu Zhang, SDSU Chinese professors, Confucius Institute staff members, friends of CI Professor Anne Rosser and Xiamen University Arts Troupe performers. After the ceremony, a luncheon was held in honor of Vice President Wu and the Xiamen University delegation. At the luncheon, Dr. Marlin welcomed the guests from Xiamen University and expressed her appreciation to Xiamen University for their long-term support to the Confucius Institute at SDSU. Vice President Wu presented a traditional Chinese painting as a gift from Xiamen University to the Six Arts Center. He said, “I really wish that the collaboration between the two universities will become closer and closer”. “The Six Arts Center aims to demonstrate the Six Arts of Confucianism… for all of our students, faculty members, alumnus, and community members can come in here to enjoy a piece of China. People should be able to work together through mutual understanding. Now we can really begin to showcase our six arts to students and our community. ” said CISDSU Managing Director Dr. Lilly Cheng. 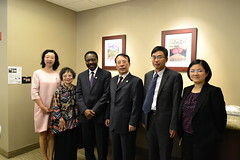 In the morning of September 21, Xiamen University Vice President Dr. Daguang Wu, met with SDSU Senior Vice President and Provost Chukuka Enwemeka at Manchester Hall on SDSU campus. 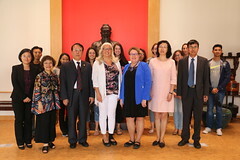 Council Chair of Southern Base of Confucius Institute Headquarters Ms. Li Fan, Section Chief of Southern Base of Confucius Institute Headquarters Ms. Dongmei He, CISDSU Managing Director Dr. Lilly Cheng, Co-Director Professor Cunlu Zhang also attended the meeting. Provost Enwemeka warmly welcomed the delegation. At the meeting, they discussed further collaborations between the two universities. Vice President Wu and Ms. Fan also expressed their appreciation to SDSU for supporting CISDSU; they also invited Provost Enwemeka to the Confucius Institute Conference in Xiamen University at the end of this year. 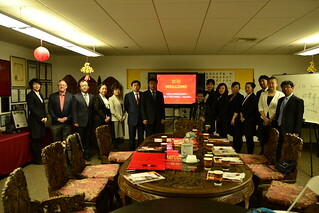 In the morning, the delegates visited the Confucius Institute Six Arts Center. 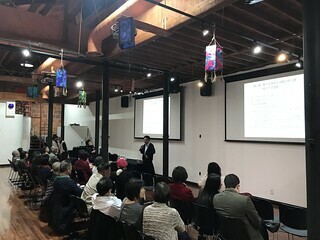 Dr. Cheng and Professor Zhang introduced the Center’s function of promoting the Confucianism Six Arts on campus and to Confucius Classroom students. Vice President Wu highly valued the innovative design of the Center and looked forward to the continuous partnership between Xiamen University and CISDSU. The visit has strengthened friendship, communication, partnership and collaboration between the two universities and will enhance the further development of CISDSU. On September 20, 2017, the Confucius Institute at San Diego State University invited Xiamen University (XMU) Arts Troupe to the Confucius Classroom School at Adobe Bluffs Elementary School. The XMU Arts Troupe brought spectacular performances featuring Chinese traditional dance, instruments, martial arts, singing etc. The program was hosted by Principal Edward Park and Chinese teacher Julie Li. 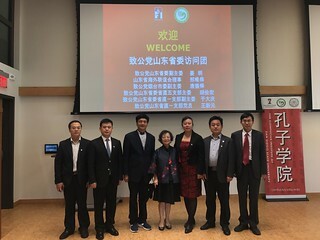 Ms. Li Fan, Council Chair of Southern Base of Confucius Institute Headquarters; Prof. Cunlu Zhang, CISDSU Co-Director; and Ms. Anne Chu, CISDSU Project Manager participated in the event. The performances were to celebrate the upcoming Moon Festival, which is an important festival that celebrates the full moon and the harvest season in China and in many other Asian countries. 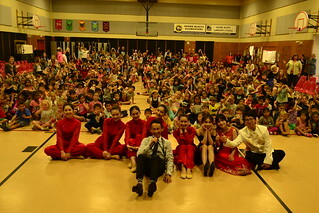 Over 300 students and teachers watched the performances and enjoyed the celebration. On September 12, the Confucius Institute at San Diego State University participated in the 2017 SDSU Fall Study Abroad Fair at North Library Walk. 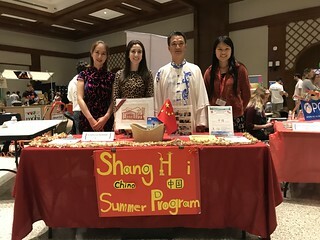 CISDSU Project Coordinator, Ms. Chudan Li exhibited a table introducing the 2018 Shanghai Summer Program. Over 100 students visited our table to learn about this unique study abroad opportunity. From September 9 to September 10, the Confucius Institute at San Diego State University (CISDSU) hosted the Fall Semester Hanban Teachers’ Training at the Six Arts Center. 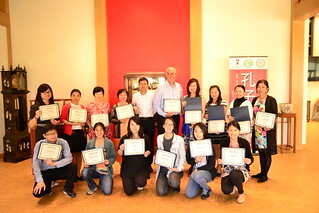 32 Hanban teachers attended the training on September 9. The next day, 9 new Hanban teachers participated in the New Hanban Teacher Orientation. Speakers for the training included CISDSU Managing Director Dr. Lilly Cheng, Co-Director Professor Cunlu Zhang, and Project Manager Ms. Anne Chu. The two-day training focused on the topics of Leadership, News Coverage, Proper Etiquette, and CI’s Six Arts Program. Dr. Lilly Cheng presented the concept of “servant leadership” – a leader who knows how to self-develop and serve others. She highlighted that “Continuous Improvement” is the core for CISDSU’s future development. She also encouraged all Hanban teachers to improve leadership skills and better serve their students, schools and communities. Professor Zhang emphasized on the topic of news coverage. By discussion and brain-storming, he led the teachers to re-define goals in report writing. Ms. Anne Chu spoke about proper etiquette and cultural adaptation. Her topic focused on helping Hanban teachers to be more culturally comprehensive, so that they can more readily adjust to American life and teaching in American classrooms. CISDSU aims to enhance the quality of their teachers by hosting trainings and workshops to build teamwork, as well as providing a platform for them to exchange ideas and experiences. Each training or workshop is considered a great opportunity for “continuous improvement” – which is also what "CI" stands for – in order to provide better Chinese language and culture education to San Diego. Monday, July 31, 2017 was the first day of the annual Chinese Summer Camp Program organized by the Confucius Institute at SDSU. The two-week camp’s mission was to develop and improve the students’ Chinese proficiency during the summer break, as well as teach them other elements of Chinese culture and education, such as Abacus class. The curriculum used, “Ten Days Traveling in China,” introduced a new region’s culture almost every day, focusing on food, famous places, and other highlights. This year, twenty one students from 2nd to 5th grade participated. Of all the activities, students seemed to most enjoy making dumplings, but that certainly does not mean they did not have a lot of fun in the other activities. While all the activities engaged the children, each of the many activities which involved creativity were extremely popular, such as folding little paper-cut dogs, Beijing opera-style mask painting, using clay to simulate making animal-shaped steamed buns, and using calligraphy brushes to paint pandas with adorably unique expressions. Their field trip to Balboa Park and the Museum of Art in the second week was a change of routine, bringing the students to the culture rather than vice versa. Students were bursting with curiosity and questions, peering intently at the artifacts and eagerly touching the few items they were permitted to touch. Starting from day four, students began in earnest to practice and prepare for the performance on the final day, which included chanting a tongue twister and keeping rhythm with the kuaiban, two song and dance numbers, kung fu, a short play, and abacus drills. Every day, the students exhibited great creativity, energy, and at times even focus. It has been a privilege and an honor to invest in these students, and we hope to see your children next year! 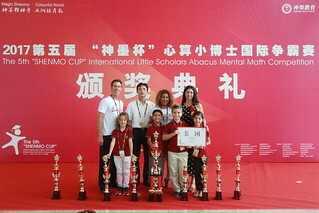 From July 21st to the 23rd, students of the Confucius Classroom affiliated with the Confucius Institute at San Diego State University (CISDSU) joined the 2017 fifth “Shenmo Cup” international tournament of abacus and mental math, which is run by Shenmo Education. After several selection rounds, Confucius Institute students Leah Markworth, Christopher Santy, Jenna Perman, Harmony Richardson, Texas Zubiller, and Kassia Love successfully entered the final competition held in the Beijing International Convention Center and achieved outstanding results. Among the more than 1200 contestants participating in this competition, there were over 300 representatives from 18 countries across the globe. The gist of the competition lay in the demonstration of the fruits of promoting Chinese abacus overseas, in strengthening and promoting each country’s educational exchange in regards to mental abacus, and in spreading China’s fine culture abroad. As for July 23, 2017’s rewards ceremony, CISDSU Managing Director Dr. Lilly Cheng mounted the stage and delivered a short speech. Confucius Classroom’s students also mounted the stage to display their Chinese talents, including Beijing Opera, folk dances, and martial arts. Their excellent performance made the audience below gush with acclaim. From July 1st to July 15th, 2017, Confucius Institute at San Diego State University project coordinator Ms. Chudan Li led a group of 11 students on a two week short-term study abroad program to Shanghai, China. 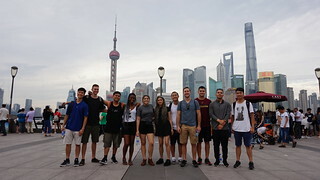 The students had the opportunity to explore different parts of Shanghai, Suzhou, and Hangzhou while attending classes on Chinese culture, history, and business practices. As they were learning about Chinese culture, students participated in a wide array of activities. They visited the iconic water town Zhouzhuang, learned about Chinese medicine from Dr. Daozheng Li, meditated with a zen master, visited museums, and enjoyed a Classical performing art, the Chinese face-changing opera. These activities, among others, gave the students a better understanding and appreciation of Chinese culture. This two week program was just a glimpse of one of the largest countries in the world. At the end of the program, the students expressed gratitude for the opportunity to experience such a wonderful city as well as their desire to return in the future. 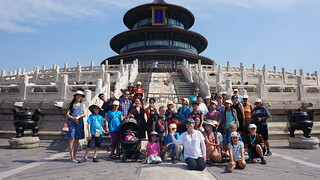 From June 19th to July 2nd, thirty-nine Barnard Elementary School 5th grade students and families along with friends of the Confucius Institute journeyed to China. For the 5th graders, this was their first trip to China and their official graduation trip after moving up from the Chinese Immersion Program this year. During their stay in China, students took the opportunity to practice their Chinese skills and fully immerse themselves in Chinese culture. The program was organized by the Confucius Institute at San Diego State University (CISDSU) and led by Project Coordinator Ms. Chudan Li. The three major destinations were Beijing, Xi’an and Chengdu. During the trip, students visited the Great Wall, the Forbidden City, the Terra-Cotta Warriors and many other local attractions. They also volunteered for the Giant Panda Reserve while visiting Sichuan Province. Highlights of the program included visits to the Confucius Institute Headquarters (Hanban), Shenmo Abacus Museum and Jiangnan Culture and Arts School. Through interactive activities at these institutes, students not only had an extraordinary and unique experience learning about Chinese culture and China, but also made many life-long friends from China who are similar to their age. At the end of the trip, many students and families expressed their appreciation to CISDSU, for the life-changing and rewarding experience they learned through the program. Students also promised to continue to learn Chinese as they enter middle school, and hope to visit China again in the future. Headed out on June 19, 2017, 12 middle & high school students from various Confucius Classroom schools associated with CI/SDSU left for China for a summer camp program in China organized by Confucius Institute at San Diego State University. Little did they realize that the next 2 week’s experience would be a life changing journey which also gained them numerous friendship near and far. 2017 CI/SDSU summer camp in China for American high school students was designed customarily for the students of Confucius Classroom schools associated with CI/SDSU. For many of them, this was their first international trip, and first visit to China. This year’s itinerary included Xiamen and Chengdu. 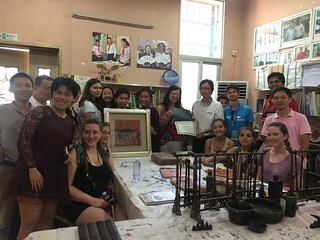 Co-administered by CI/SDSU’s partner in China, Xiamen University, this summer camp program comprised of Chinese language course, Chinese cultural activities, and local excursions to allow the students to be fully immersed in the local culture. The 2 week itinerary led by CI/SDSU Project Manager, Anne Chu, brought the group to Hekka Tulou, Gulangyu (Piano Island), South Putuo Temple in Xiamen, and Jinsha Ruin, Kuan/zhai Alley, Chengdu Research Base of Giant Panda, Dujianyan Aquiduct in Chengdu, and many other sites. Also, students were able to mingle with local students at both cities, learning and sharing what typical teenagers are interested in. On Friday, June 9, the Confucius Institute at San Diego State University (CISDSU) hosted the Six Arts Program Appreciation Luncheon at the Six Arts Center on campus. The luncheon is to honor all the Six Arts teachers and volunteers who have supported the 2016-2017 Barnard Six Arts Program. CISDSU Manager Director Dr. Lilly Cheng, Project Manager Ms. Anne Chu, and Barnard Asian Pacific Language Academy Principal Aida Hernandez attended the luncheon and expressed their gratitude to the teachers. Launched in October, 2016, the Six Arts Program at Barnard focuses on the teaching of Confucianism Six Arts: Etiquette, Music, Archery, Charioteering, Calligraphy and Mathematics. Subjects include Chinese Culture (Tea ceremony etc. ), Music, Musicals, Chinese Chess, Go Game, Tai-Chi, Calligraphy and Painting, and the Abacus. Over 30 Chinese teachers and volunteers, including CISDSU staff members, have led by example by creating the Six Arts curriculums and implementing the curriculums for our students. All of them are recognized and appreciated at the luncheon today. At Barnard, through exploring and learning each art, students have gained a deeper understanding of Chinese culture, which is a great addition to their Chinese language education. Over the past year, the Six Arts Program has proved tremendously successful in educating our students to be global citizens. In the future, CISDSU aims to extend the Six Arts Program to more Confucius Classrooms. With the new Six Arts Center on SDSU campus opening to our students and community, CISDSU will continue to inspire a new generation based on the Six Arts of Confucianism, and also provide the resources needed for learning the Chinese language and culture. 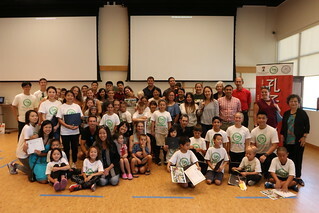 On June 7th, 2017, Confucius Institute at SDSU (CISDSU) participated in Barnard Field Day to introduce Chinese outdoor games to students, teachers and parents. Field day has been a tradition in Barnard, and aims at creating opportunities for students to experience different sports and participate in diverse cultural activities. Students in pre-K through fifth grade completed 14 stations and each station hosted a different activity such as Chinese YoY o, surfing, or fencing. Each class in each grade level spent the morning rotating through the 14 activity stations. 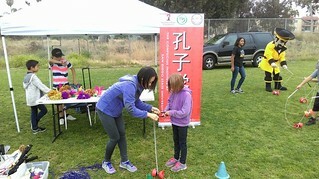 At the CISDSU station, students learned how to play traditional games like shuttlecock, Chinese jump rope, kite and yo-yo. Students loved all the games and had a lot of fun. Students also learned the history of these activities, which helped them to understand and appreciate a different culture. The event was a huge success. On June, 3, 2017, Confucius Institute at San Diego State University participated in San Diego’s County Fair 2017 Asian Festival at Del Mar Grounds. 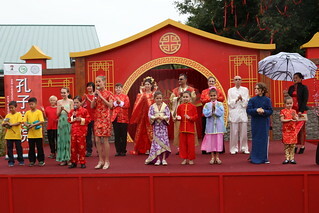 Various cultural performances representing different countries in Asia such as China, Korea, India, Japan, the Philippines and were shown at the Fair. Award-winning students from this year’s Chinese Bridge Competition brought to the audience extraordinary performances which showcased the Confucianism Six Arts – etiquette, music, archery, charioteering, calligraphy and mathematics. These arts are traditional Chinese wisdoms; they form the basis of education in ancient Chinese culture. At the festival, the audience had the opportunity to sample the essence of each art. Performances included: Lion Dance performed by the Abbouds family from Riverview International Academy; Mongolian Song: The Lasso Pole performed by Nandi Franklin from Barnard Elementary; Group Tongue Twister performed by Barnard 1st grade students; Peacock Dance performed by Harmony Richardson, from TDS middle school; Chinese Kung-Fu, performed by Christopher Santy, from Pacific Beach Middle School; Chinese Yo Yo, performed by Riverview International Academy Yo Yo Club; and Chinese Song: A Thankful Heart performed in Chinese Sign Language by Kamy Carter and sung by Leah Markworth, both of whom are champions from the Chinese Bridge Competition. On May 13th, 2017, the Confucius Institute at San Diego State University (CISDSU) hosted a “Dim Sum and Tea Gathering”. 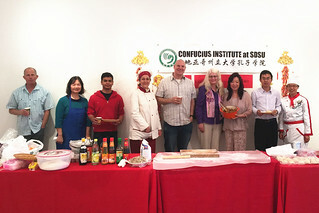 The event was held at the Confucius Institute Six Arts Center on the SDSU campus. Over 80 guests participated in this event. Dr. William Tong, our honorary guest speaker of the event, delivered a lecture on “Terracotta Warriors and Silk Road Mummies”. With the theme “East Meets West”, our Chinese and Western style of Dim Sums and traditional Chinese tea ceremony were the main focuses of the event. The fragrance of Chinese Longjing tea and Tieguanyin tea attracted guests to our tea house, which was decorated with refined tea wares and Chinese style furniture. Guests tasted Eastern and Western styles of Dim Sums, such as “Taichi Eggs” (a combination of tea eggs and deviled eggs), “Rainbow Noodles”, Belgium Endive, Rice Bowl, Golden Sesame Balls, Spring Rolls, Fruit Kebab and so on. Tea and Dim Sum represented Etiquette and Management, which are essential parts of the Six Arts. The Six Arts are the educational philosophy of CISDSU. At the event, CI staff members and Hanban teachers presented our Six Arts families: Etiquette (tea), Music (Chinese instruments), Archery (Taichi), Charioteering (Dim Sums), Calligraphy (Chinese calligraphy and brush painting) and Mathematics (Abacus). As the guests walked into our brand new Six Arts Center, while enjoying our delicious dim sum and tea, they got a taste of the Six Arts by visiting different stations. 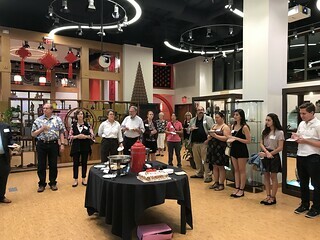 Though conversations and interactions, guests learned about how CI immersed the Six Arts into teaching Chinese and Chinese culture, which are well-received in our Confucius Classrooms and local community. 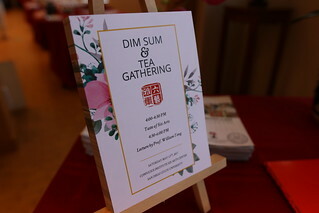 The Dim Sum and Tea Gathering event was the first look at the new Six Arts Center. In the future, our new Center will be used for multiple functions including lectures, exhibitions, meetings and events. With the concept of Confucianism Six Arts, the Center aims to develop more cultural and educational programs in order to serve our students, faculties, and community. On May 6th, 2017, the 8th Annual Asian Cultural Festival of San Diego was held at Mira Mesa Community Park. This year, Confucius Institute at San Diego State University (CISDSU) celebrated the festival with students who come from Confucius Classroom, presenting Confucius Six Arts on the stage. Award winning students from this year’s Chinese Bridge Competition brought to the audience extraordinary performances which showcased the Confucianism Six Arts – etiquette, music, archery, charioteering, calligraphy and mathematics. The arts are traditional Chinese wisdoms; they formed the basis of education in ancient Chinese culture. At the festival, audience had the opportunity to sample the essence of each art. Performances were included: Lion Dance performed by the Abbouds family from Riverview International Academy; Mongolian Song: The Lasso Pole performed by Nandi Franklin from Barnard Elementary; Group Tongue Twister performed by Barnard 1st grade students; Peacock Dance performed by Harmony Richardson, from TDS middle school; Chinese Kung-Fu, performed by Christopher Santy, from Pacific Beach Middle School; Chinese Yo Yo, performed by Riverview International Academy Yo Yo Club; Chinese Song: A Thankful Heart performed in Chinese Sign Language by Kamy Carter, and sung by Leah Markworth, both are champions from the Chinese Bridge Competion. In addition, CISDSU’s cultural exhibition hosted different types of cultural activities, including Chinese calligraphy, Chinese Yo Yo, Jianzi, Chinese knot making, and paper cutting, which attracted hundreds of visitors. On May 4th, 2017, the “2017 Spring Chinese Class Graduation Ceremony” was held at the SDSU Imperial Valley Campus. At the ceremony, Hanban teacher Ms. Jianchun Ren hosted a film showing at the library. The film, Twenty-four Form Tai Chi, produced by Ms. Ren, featured Chinese class students performing Tai-chi in 24 different forms. Graduating students was surprised to see themselves becoming the leading actors and actresses of the film. 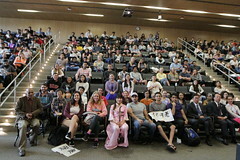 After the film, students expressed their appreciation to CISDSU for hosting Chinese language and culture courses at IVC. 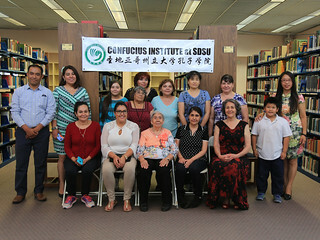 CISDSU opens three courses at SDSU-IVC: Mandarin, Tai-Chi and Chinese Tea Culture. These courses are free and open to local community with flexible schedules. Hanban teacher Ms. Ren incorporates Chinese cuisine in her culture lessons, such as making dumplings and steam buns. Chinese traditional arts such as Chinese knot, calligraphy are also included in the curriculum. All these activities aim to immerse students into an authentic Chinese learning environment. On April 29th, 2017, Confucius Institute at SDSU (CISDSU) hosted the April Teachers’ Training Workshop. Over 30 Hanban teachers participated in the workshop. Our first speaker is Professor Guosheng Ding, who is from Peking Normal University Cognitive Neuroscience Department. His lecture focused on “Bilingualism: Language & Cognition”. By showing the research results related to the brain and bilingual education, he pointed out that for English speakers, learning Mandarin can activate their right brains. He also suggested that students who learn Mandarin in their early age under immersion environment can shorten the period of time in mastering the language. Our second speaker, Dr. Jingyan Wang, is an experienced Traditional Chinese Medicine doctor. He explained the importance of the concept “Harmony”, which roots in Chinese culture and plays an important role in Traditional Chinese Medicine. The Chinese believes in “harmony and peace” when encountering a foreign culture. They embrace differences culturally and linguistically. Mr. Aaron Hoffman is the third speaker. He shared his English teaching experiences in Greek; he also showed some examples on how to use American idioms and everyday expressions. At the end of the workshop, CISDSU Managing Director Dr. Lilly Cheng presented “Six Arts” certificates to speakers, to appreciate their contribution in developing Six Arts education to Confucius Classrooms. On April 27, 2017, the Confucius Institute at San Diego State University hosted a lecture on Chinese health and wellness on the SDSU campus. 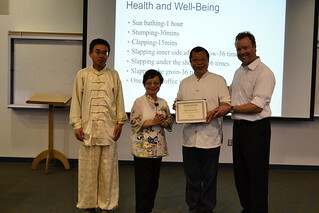 Invited by SDSU Philosophy Professor Mark Wheeler, CISDSU Managing Director Dr. Lilly Cheng, Co-Director Professor Cunlu Zhang, CISDSU special guest Dr. Jingyan Wang presented Taichi, Chinese Yin-Yang, and wellness exercises. At the beginning of the lecture, Professor Zhang and Professor Wheeler performed Taichi movements to the students. The slow, low intensity, alert movements showcased aspects of ancient Chinese medicine, philosophy and martial arts. Afterwards, Dr. Jingyan Wang, a Traditional Chinese Medicine expert, introduced the ancient Chinese concept of Yin and Yang. He also demonstrated some Chinese wellness exercises to the students, which help one to reduce symptoms and stay healthy. On April 25, 2017, Confucius Institute at San Diego State University (CISDSU) participated in the opening night for the 7th Annual San Diego Asian Film Festival (SDAFF) Spring Showcase. CISDSU Managing Director, Dr. Lilly Cheng, staff members, and friends of CISDSU gathered together to enjoy the documentary “Abacus: Small Enough to Be Jailed”. The abacus is considered to be a national treasure in China, which is one of the reasons the creators chose this name. The documentary focuses on owners of Abacus Federal Savings of New York’s Chinatown-Sung family, which was accused of mortgage fraud in the wake of the 2008 financial crisis. The Sung family then started their 5-year long battle to defend themselves and their bank’s legacy in New York Chinatown. On April 21st, 2017, San Diego State University-Imperial Valley Campus hosted the third Annual “Taste of the Valley” Scholarship Fundraise Event. CISDSU Co-Director Prof. Cunlu Zhang and CI staff members participated in the event, bringing Chinese traditional Jasmine tea for support. Dean of SDSU-IVC, Dr. Gregorio Ponce greeted our staff and appreciated CI’s support to the event. More than 200 guests participated in the event to support the fundraising. The evening program began with light music, followed by students sharing their achievements at SDSU-IVC. On the sides, food vendors displayed their finest feature items. Many guests made generous contributions, which would support the scholarship program thus benefit IVC students, providing opportunities for students to further studies. On April 2nd, Confucius Institute at San Diego State University (CISDSU) Confucius Classroom students participated in the 4th WeChinese in America Chinese Youth Festival. The Festival was held at the Poway Performing Arts Center. Pacific Beach Middle School students Leah Markworth and Christopher Santy served as the emcees for the event. The audience was amazed by their high level of Chinese proficiency. Barnard Asian Pacific Language Academy student Angelia Coenen performed Kuaiban, Riverview Elementary Academy students performed Chinese Yo Yo, and both performances became the highlight of the evening and won rounds of applause from the audience. 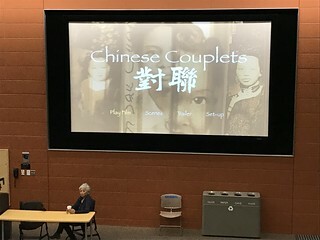 On March 22th, the Confucius Institute at San Diego State University (CISDSU) participated in the film screening event for the documentary “Chinese Couplets” on the SDSU campus. The event was co-sponsored by CISDSU, Department of History, the Center for Asian and Pacific Studies, the Department of Women’s Studies and the Department of Political Sciences. 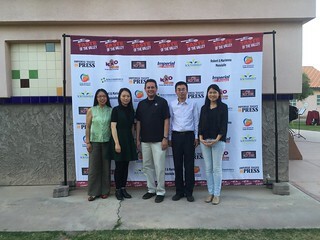 CISDSU Co-Director Professor Cunlu Zhang and Project Coordinators Chudan Li and Yueying Zhan attended the screening. The one-hour documentary focuses on the filmmaker’s search for answers about her mother’s emigration to America during the Chinese Exclusion era and reveals the often painful price paid by immigrants who abandon their personal identity. After the film screening, Director Felicia Lowe discussed with the audience about her 17-year journey of making the film. Chinese couplets are the metaphor she used for the relationship between mothers and daughters – two couplets that are separated yet the meaning is connected, similar to mothers and daughters. Felicia Lowe is an award winning independent producer, director, and writer. Through supporting the film screening event, CISDSU provided a platform for students to learn about Chinese Americans, cultural identities and immigration history. We hope that attendees of the event are educated on Chinese American issues as well as inspired by the film and presentation. 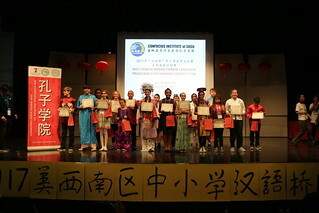 On March 17, 2017, Consulate General of the People’s Republic of China in Los Angeles Education Office and Confucius Institute at San Diego State University (CISDSU) co-hosted the 2017 Chinese Bridge Language Proficiency Preliminary Competition at the Mission Bay High School Auditorium. Seventy-two contestants from elementary, middle and high schools in southern California and Arizona participated in the contest. Consular Dong Yuan and Haiying Chai from the Chinese General Consulate Office in Los Angeles attended the event. Dr. Lilly Cheng, Managing Director of CISDSU, served as the emcee. 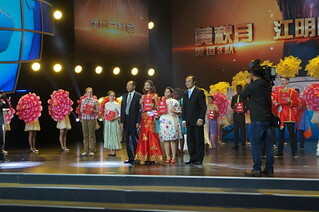 The contest consisted of three parts: an oral speech, a quiz session on Chinese culture and history, and a talent show. The speech topics this year were “我认识的中国人” (A Chinese Person that I know) for K-5 grade group, “学习汉语的乐趣” (Fun in learning Chinese) for 6th-8th grade group and “我要去中国” (I want to go to China) for the 9th-12th grade group. In front of the judges and the audience, contestants featured their special talents, including Peking Opera, Lion Dance, Hulusi, Chinese paper cutting, etc. Their Chinese fluency and unique talents made this competition a fantastic performance for the judges and the audience. Thanks to the efforts of CISDSU staff, Hanban teachers and volunteers, the contest has exceeded the past ones in the scale and contestants’ performance; inspired more students’ passion in learning Chinese. It also expanded the influence of the Confucius Institute as well as the Chinese Bridge Competition. 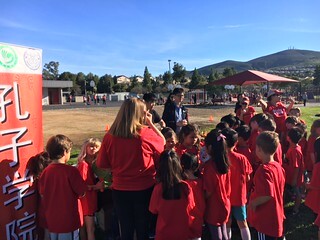 On March 09, 2017, the Confucius Institute at SDSU (CI SDSU) participated in Run to Play and AB Games event which was hosted by Adobe Bluffs Elementary School. CI SDSU represented the Chinese Outdoor Activities station, and introduced Chinese outdoor activity to students, teachers and parents. Students learned how to play traditional games with the Jianzi, or shuttlecock and the Chinese Yo-Yo as well as badminton, a nationally enjoyed sport. Students also learned about the origins of these activities from CI staff Muting Huang and Jason Huang. All the students enjoyed the activities and left for their next station with great excitement but reluctance. The event was a huge success. Students not only enjoyed playing these Chinese outdoor activities, but also learned the history of these activities and appreciated a different culture. This event aims to promote health and fitness as well as to experience different cultures. There were six Health & Fitness stations and each station hosted a different activity, and each class rotated to each of the stations. 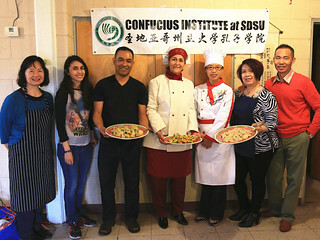 On March 8th, 2017, Confucius Institute at San Diego State University (CISDSU) hosted the “Chinese Cooking: Baozi” event at SDSU’s Imperial Valley Campus. CISDSU Co-Director Professor Cunlu Zhang and Project Manager Ms. Anne Chu traveled from San Diego to Imperial Valley to support the program. The event was organized by Hanban teacher at IVC, Ms. Jianchun Ren. Over 30 Imperial Valley Campus students, staff, faculty and community members participated in this event. The new Dean of Imperial Valley Campus, Professor Gregorio Ponce came to taste the delicious Baozi. Local media journalists reported and interviewed CISDSU about this event. Baozi, also called Chinese steamed buns, is a type of traditional dish for Chinese families. Ms. Ren prepared three types of fillings: pork, beef and carrots. The class started with chopping the vegetables and meat. Then, Ms. Ren introduced her secret recipes: when folding the wrapper, fold in the same direction; the wrapper should be thicker in the middle and thinner on the outside; and after steaming, let the Baozi rest for 3-5 minutes in the steamer. Ms. Ren also demonstrated the techniques to students while giving her instructions. By the end of the class, participants not only learned about how to make and cook Baozi, but also experienced the Chinese culture. The cooking event lasted for four hours. Students took home the Baozi they made to share with their friends and families. They thanked Ms. Ren and CISDSU for hosting such a fun and educational experience. On March 7th, 2017, Hanban teachers of Riverview International Academy held a spring semester meeting. The meeting was to discuss teaching plans for the new semester, to prepare for the upcoming Chinese Bridge Competition, as well as to celebrate International Women’s Day on March 8th. 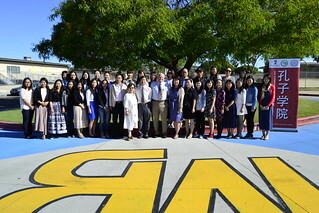 The Confucius Institute at San Diego State University Co-Director, Professor Cunlu Zhang, Project Manager Ms. Anne Chu and all Riverview Hanban teachers participated in the meeting. At the beginning of the meeting, Professor Zhang and Ms. Chu expressed their holiday wishes to the teachers. Then they discussed their preparation plan for the upcoming Chinese Bridge Competition. For the Competition, Hanban teachers play the role of supporting students and promoting the Chinese language. At the meeting, Professor Zhang also addressed that by having self-assessments, improving teaching techniques, and exchanging ideas with other teachers, they will become successful Chinese language teachers and fulfill their mission to promote Chinese culture overseas. Riverview International Academy is a Confucius Classroom School of CISDSU, which is well-known for its Chinese Immersion Program. In the 11th Confucius Institute Annual Conference, Riverview was awarded the “Confucius Classroom of the Year” among over 1000 Confucius Classrooms in the globe. Riverview Hanban teachers were also awarded certificates of excellence by CISDSU, for their exemplary dedication and significant contribution towards the promotion of Chinese language and culture in San Diego. On March 4th, 2017, Confucius Institute at San Diego State University (CISDSU) held a Chinese teachers’ training. The training provided a platform for Confucius Classroom Hanban teachers to discuss how to improve communication skills and Mandarin teaching skills. At the beginning, Hanban teachers introduced themselves and expressed their passion and love in teaching Chinese. “I’m passionate about my work here. I love my children.” said one of the Hanban teachers. Afterwards, CISDSU Managing Director Dr. Lilly Cheng shared her insights about cross-cultural communication between Americans and Chinese. She introduced the “Sandwich Method” used in delivering feedback or criticism; she also explained the “Tennis Principle”, which is the American style of communication. Co-director Professor Cunlu Zhang addressed on the topic of “Safety, Efficiency, Achievements, and Progress”. He encouraged Hanban teachers to build positive relationship with students, local teachers, school administrators, and parents. At the end of the meeting, many Hanban teachers expressed that they found the training helpful and that continuous improvements are needed on their cross-cultural communication skills. On February 28th, 2017, CISDSU Advisory Board Member and San Diego County Supervisor Mr. Ron Roberts visited the New Confucius Institute Culture Center at San Diego State University. 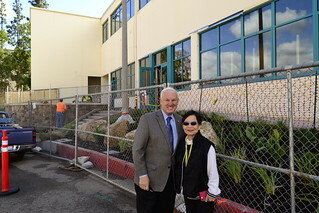 Managing Director of CISDSU Dr. Lilly Cheng welcomed Mr. Roberts at the new Center. She gave an overview of the construction project including the design scheme, as well as the bidding, approval, and construction process. The Center will be used for classes, workshops, performances and exhibitions. Mr. Roberts expressed that the Center will more widely serve the San Diego region in the promotion of Chinese language and culture. 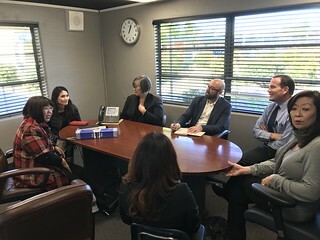 On Friday, February 27, 2017, a group of visitors from Confucius Institute at Long Beach State University visited Barnard Asian Pacific Language Academy and Riverview International Academy. Both are Confucius Classroom schools affiliated with Confucius Institute at San Diego State University. The group consisted of Dr. Teri Shaffer Yamada, Professor and Chair, Department of Asian And Asian American Studies; Dr. Terrence Graham, Associate Dean & Executive Director of International Programs; Heidi Zhang, Director of International Training Programs and Confucius Institute at CSULB; Kevin Xue, Associate Professor, Confucius Institute at CSULB; and Monica Zhu, Project Coordinator at Confucius Institute at CSULB. 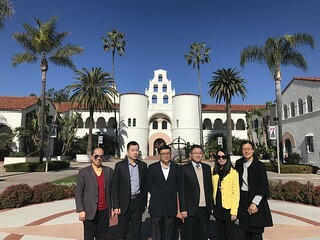 These visitors came to visit CI/SDSU and Confucius Classroom schools in San Diego County to learn about the key points of CI/SDSU’s well established programs and the successful Mandarin immersion programs. Dr. Lilly Cheng, Managing Director of Confucius Institute at San Diego State University, and Anne Chu, Project Manager of Confucius Institute at San Diego State University, greeted these guests warmly upon their arrival. In her opening welcome speech, Dr. Cheng shared with them the main focus of CI/SDSU and the fundamental characteristics backing the outstanding performance by the students at both schools. She encouraged these educators to seek their own path to establish a unique program fitting the local needs and requirements at Long Beach, Los Angeles. All guests were led through a thorough campus tour at both school sites. They witnessed how teachers in the immersion program managed to communicate with young students in Mandarin, and they were amazed at the proficiency level demonstrated by students as young as kindergarten and first grade. They also visited some classrooms where the Confucianism ‘Six Arts’ Project was being implemented by CI/SDSU Chinese culture teachers. At the end of their visit, these educators were truly impressed by the best practices modeled at every classroom. They recognized that the remarkable accomplishments at each school resulted from the relentless perseverance of every CI/SDSU staff member, and a marvelous team of Hanban teachers who shared a mutual vision and goal with CI/SDSU. On February 23rd, 2017, a delegation of 13 professors from Heilongjiang Polytechnic paid a visit to the Confucius Institute at San Diego State University. The delegation was led by Professor Brian Blake, Director of the Marriott Foundation Student Center for Professional Development. CISDSU Manager Director, Dr. Lilly Cheng, warmly welcomed the group. At the meeting, Dr. Lilly Cheng introduced CISDSU and its Chinese language and culture promotion in Southern California and Baja California region. Then she introduced CISDSU’s Confucius Classrooms and community programs. Both parties look forward to collaborations in the future to further promote Chinese language and culture in San Diego. On February 18, 2017, Confucius Institute at San Diego State University participated in the Annual Lunar New Year celebration at SeaWorld San Diego. About 20 Confucius Classroom students and parents performed on stage in a Chinese culture program featuring “Six Arts of Confucianism”, which depicts the modern definition of Rites, Music, Archery, Management, Calligraphy, and Mathematics. The show was emceed by Leah Markworth and Christopher Santy, two students from Confucius Classroom at Pacific Beach Middle School. They introduced the essence of each art form in perfect Mandarin. The audience was dazzled by the gorgeous red and gold gown on Empress Wu Ze Tian, the only empress in Chinese history, at the beginning of the show. Followed with performances by students and parents of Confucius Classroom at Riverview International Academy showcasing their talents in music, dancing, Abacus, Kuaiban, Taichi and Chinese Yo-Yo. 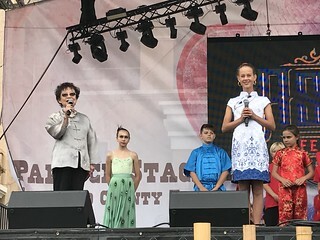 The highlight of the performance was a duet song “Grandmother’s Penghu Bay” sung by Leah Markworth and her younger brother Alex Markworth, they both had won first prize at the Chinese Bridge Chinese Language Proficiency Competition, hosted by CI/SDSU, in the past. This year marks the third year of CI/SDSU participating in SeaWorld’s Lunar New Year celebration. It was a wonderful opportunity for the audience to learn more about Confucian Six Arts from the talented Confucius Classroom students presenting their talents in Chinese language and culture. On February 11th and 12th, 2017, the 35th Annual San Diego Chinese New Year Food and Culture Fair was held at Downtown, San Diego. Confucian “Six Arts” performances organized by Confucius Institute at San Diego State University was one of the most popular programs during this 2-day celebration. The ‘Six Arts’ show included an assortment of numbers performed by students and parents from various Confucius Classroom Schools; such as Chinese songs “Spring Flowers” and “Grandmother’s Penghu Bay”, Taichi, Chinese instrument Erhu solo, Peacock dance, Abacus, Kuaiban, Cross-Talk and Chinese Yo Yo. The ensemble included 20 Confucius classroom students and parents who eagerly showed off their passion and interest in Chinese culture. The weekend event attracted many attendees from all over San Diego County. At the CI/SDSU booth, staff members and Hanban teachers assisted local children in making handcraft rooster hat, and writing Chinese names in Chinese calligraphy fashion. The activities were most popular to crowd attendees. Drafting Chinese names and presented it in Chinese calligraphy has always been a great hit, people were amazed when they learned the symbolic meaning in the Chinese characters carefully selected by CI/SDSU staff to create their name, they showed a deeper appreciation to the profound impact of Chinese culture. By presentation of Confucian “Six Arts” show and Chinese calligraphy, CI/SDSU continues its commitment to promote awareness of Chinese culture, and to generate interest in learning Chinese language among mainstream society. On Feb 1st, 2nd and 6th, the Confucius Institute at San Diego State University – Imperial Valley Campus hosted its Chinese New Year Celebration. The three-day event included four different Chinese cultural activities: Chinese tea tasting, bracelet making, mask painting and dumpling making. Through the celebration, participants have developed a more in-depth understanding of Chinese festival and Chinese culture. On February 4th, 2017, Barnard Asian Pacific Language Academy held its annual Chinese New Year Community Celebration, which attracted more than 600 hundreds of community members. 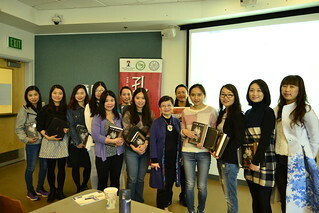 Managing Director of Confucius Institute at San Diego State University (CISDSU), Dr. Lilly Cheng, Co-Director, Prof. Cunlu Zhang, and “Six Arts” culture teachers participated in this event. 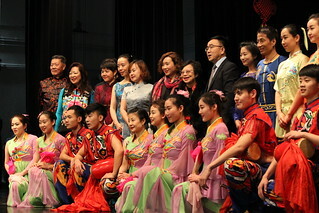 “Six Arts” teachers performed Zang Minority Dance, Chinese song, Hulusi, Taichi and Kongfu, which won rounds of applause. Hanban teachers were demonstrating Chinese paper cutting art craft to introduce customs and traditions of Chinese Lunar Year. The window behind the booth was adorned with beautiful paper-cuttings. Many students joined in the activity, eagerly showing off their craft work with excitement. CI/SDSU is dedicated to promote Chinese culture awareness and acceptance in culture diversity by bringing forth authentic Chinese culture experience to local communities. On February 04, 2017, Confucius Institute at San Diego State University (CI/SDSU) participated in the Chinese New Year Celebration hosted by Chinese Community Church. Nearly 400 people gathered for a celebration of the Year of Rooster. Led by Managing Director of CI/SDSU, Dr. Lilly Cheng, a troupe of Six Arts culture performers provided the main entertainment for the evening. Dr. Cheng introduced the essence of Confucianism “Six Arts” at the beginning of the show. An inspiring beat on the Gong instrument, hit by Justice Bao Gong, marked the beginning of the show. Hanban teachers played Guzheng, Hulusi, and Mongolia dance; CI staff drew “One Stroke Painting-Rooster” to welcome the Lunar Year of the Rooster. The highlight of the evening was a duet act by Leah Markworth and Alex Markworth, both were champions of Chinese Bridge Chinese Language Proficiency Competition in the past. The audience was in awe by the spectacular contents of the show as they awarded these performers with numerous rounds of applause. CI/SDSU is actively engaged in many Chinese New Year celebrations each year in local community, bringing cultural experience to the public and strengthen its collaboration with local community organizations. On February 03, 2017, Barnard Asian Pacific Language Academy hosted its annual Chinese New Year celebration. 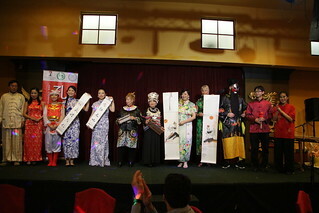 This is the first time that the Six Arts Culture program, sponsored by Confucius Institute at San Diego State University, was the main feature in the show. 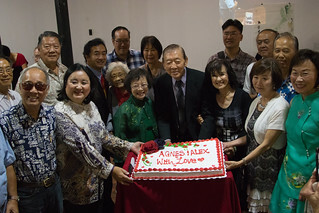 Managing Director of CI/SDSU, Dr. Lilly Cheng, Project Manager, Anne Chu, and all Six Arts culture teachers were present at this special gathering. Hundreds of eager parents and relatives swarmed into the school auditorium early in the morning, anxiously anticipating students’ performance. Led by Six Arts culture teachers, each class appeared on stage demonstrating what they had learned, Chinese Kong Fu, Taichi, music, Kuaiban and Chinese calligraphy to name a few. The audience awarded students with thunderous applause as they could hardly contain their excitement and pride. Many parents and community members approached Principal Aida Hernandez and Dr. Lilly Cheng to share their compliments for a marvelous show. They were pleasantly surprised how much students had learned in such a short period since October 2016, when Six Arts Culture Project was launched. Six Arts Culture project is the first pilot Chinese culture classes being implemented in the regular curriculum in any public school system. Everyone, including students, administrators, faculty members, parents and CI/SDSU culture teachers, is looking forward to the second session of Six Arts Culture project, scheduled to begin on February 13. On February 02, 2017, a world class show was staged in the auditorium at Mission Bay High School, one of the Confucius Classroom schools in the Mission Bay Cluster affiliated with Confucius Institute at San Diego University. Organized by CI/SDSU, this show was performed by the Arts Troupe from Shaanxi Normal University under sponsorship from Confucius Institute Headquarters/Hanban. San Diego would be the first stop for the group before it moved on to other CI branches in Arizona and Florida. The Troupe, comprised of 23 faculty and students, is led by Director of International Programs Office, Feng Xu, and Vice Dean of School of Music, Jina Liu. The theme of the show, “Appeal of Tang, Charm of Quin”, was specifically chosen to emphasize the geographical essence of Xian, where Shaanxi Normal University is located. Adapting the music and dance moves of Tang Dynasty, the performers simulated the ancient style of melodies and dances to show the cultural opulence and prosperity in Tang Dynasty. Also, using classical props, dancers performed in classical Shaanxi dancing elements to feature the excitement and cheerful spirits indigenous people praying for an abundant New Year during Lunar New Year season. Of course, no Chinese culture shows would be shown without the most popular act, Gongfu. Incorporating Sword duet, stick fight and Taiji fan, the combination of power and serenity, a perfect anecdote of yin and yang, makes for an artistically exciting performance. Mr. Jack Meng, a local resident and avid supporter of CI/SDSU and Chinese culture, co-emceed the entire program along the representative from Shaanxi Normal University. 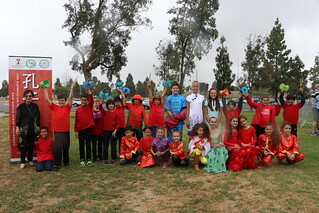 This first show of Shaanxi Normal University Arts Troupe was specifically set in the beautiful beachside of San Diego city for the faculty, students and parents of 3 neighboring Confucius Classroom Schools, Barnard Asian Pacific Language Academy, Pacific Beach Middle School and Mission Bay High School respectively. All 3 schools are offering Mandarin classes providing a streamline pathway for students K – 12 to continue their Chinese language courses. Currently, this cluster of schools is the most promising and high-performing cluster in the San Diego Unified School District; Barnard Asian Pacific Language Academy was awarded ‘Most Outstanding Confucius Classroom Of the Year” by Hanban in 2013. Before the show, students from all 3 schools went on stage to convey their New Year greetings in perfect Mandarin, winning thunderous applauds from the crowd. 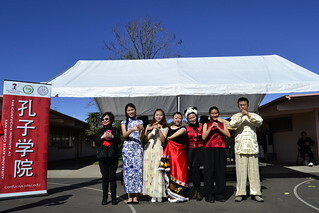 There have been numerous Lunar New Year celebrations among the 20 plus Confucius Classroom Schools affiliated with CI/SDSU in the past few weeks. The diverse variety of shows offer not just a glimpse of Chinese culture, but an ideal perspective allowing the community to learn of the greatness of Chinese language. Lunar New Year is the optimal opportunity for students to deepen their interest in their advancing learning of Mandarin. This wonderful show from Shaanxi Normal University certainly was one of the highlights among all celebrations at various Confucius Classroom Schools. On February 2nd, 2017, Confucius Classroom at Riverview Elementary and International Academy hosted the Year of the Rooster Lunar New Year Celebration. More than a thousand people, including teachers, parents and students from Riverview Elementary School, Winter Gardens Elementary, Lakeside Middle School and Tierra del Sol Middle School gathered at this festive occasion. 11 Confucius Institute Hanban teachers opened the program with a beautiful Chinese dance, “Tuberose”. 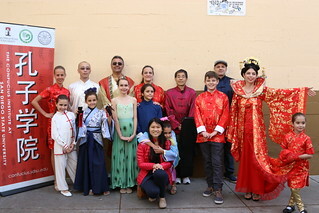 Students from Kindergarten to 7th grade presented various traditional Chinese culture performances, such as Tai-Chi, Chinese Yo-Yo, Kongfu, Chinese minority tribe dance and a Chinese play featuring the origin of Chinese New Year. Riverview International Academy was awarded “Confucius Classroom of the Year” at the 11th Confucius Institute Conference in December 2016, the only school in North America being honored with this accreditation. On February 2nd, 2017, The Consulate-General of the People's Republic of China in Los Angeles and Confucius Institute at San Diego State University (CISDSU) co-hosted the celebration of Chinese New Year at Mission Bay High School. 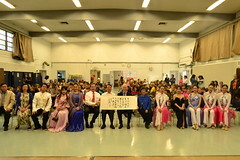 Hangzhou Opera and Ballet Theatre put on a spectacular performance for the faculty and students of Mission Bay Cluster schools. Culture Consul Wang Jin, Director Cui Wei of Hangzhou Opera and Ballet Theatre, President Michael McQuary of School Board of San Diego Unified School District, Principal Ernest Remillard of Mission Bay High School, and Former San Diego City Councilman Tom Hom, were present at the performance. The auditorium was filled with hundreds of teachers and students enthused and eagerly waiting for the show to begin. Confucius Classroom student from Pacific Beach Middle School, Leah Markworth, was the emcee for the program. Her refined Mandarin proficiency earned applause from the audience. Hangzhou performers began the show with Chinese New Year theme dances, “Happy Lunar New Year” and “Splendid China”. Other plays included traditional Chinese instrument music and Hangzhou-themed dances “Mountains Beyond Mountains” and “Dream of West Lake”. Hangzhou Opera and Ballet Theatre was founded in 1959. In 2016, its shows was the featured entertainment during the G20 in Hangzhou. Bringing this world renowned performance to Confucius Classroom schools in Mission Bay Cluster fortify CI/SDSU’s unwavering support to the most promising and high-performing cluster in San Diego Unified School District. On February 2nd, 2017, Confucius Institute at San Diego State University presented Adobe Bluffs Elementary School its Confucius Classroom Plaque which symbolizes the partnership between both parties. Among the 500 people in the audience were Culture Consul, Ms. Wang Jin, from The Consulate-General of the People's Republic of China in Los Angeles; San Diego City Council President Mark Kersey; Interim Superintendent at Poway School District, Dr. Tony Apostle; Associate Superintendent Mel Robertson, and President of School Board of Poway School District, Michelle Ratcliff O'Connor; and Provost Emerita of San Diego State University, Dr. Nancy Marlin. Managing Director of CI/SDSU, Dr. Lilly Cheng, and Principal Edward Park of Adobe Bluffs Elementary unveiled the gold plaque together to officiate the establishment of Confucius Classroom at Adobe Bluffs. Culture Consul Ms. Wang Jin presented the One Stroke painting, ”Rooster”, and City Council President Mark Kersey unboxed the gift of “Tiandee Panda”, a set of teaching materials designed and edited by Dr. Lilly Cheng, to the audience. Both gifts signify the unwavering support from CI/SDSU. After the ceremony, student emcees welcomed the troupe from Hangzhou Opera and Ballet Theatre for a series of performances. The opening dance “Happy Lunar New Year” took the breath away from the audience. Later on, an elegant solo dance “Beautiful Feathers” won rounds of applause. Other performances were Chinese instruments, Folk music and a dance play “Friends”, every program was designed with profound implication of Chinese traditions and customs for the Lunar New Year. On February 1st, 2017, The Consulate-General of the People's Republic of China in Los Angeles and Confucius Institute at San Diego State University (CI/SDSU) co-hosted a welcome banquet for the Hangzhou Opera and Ballet Theatre and the Shaanxi Normal University Arts Troupe. 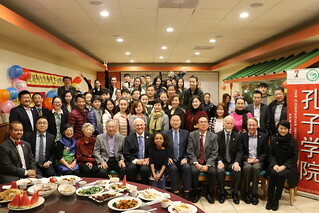 Over 80 guests were in attendance at the banquet held at Gourmet City Restaurant, including Deputy Consul-General Mr.Sun Lushan; Culture Consul Ms.Wang Jin; San Diego County Supervisor, Ron Roberts; President of School Board at San Diego Unified School District, Dr. Michael McQuary; CI/SDSU Advisory Board members, David Du and Professor Shanpu Shen, Chair of International Affairs Board of San Diego, Bruce Abrams; Former San Diego City Councilman, Tom Hom, and many principals of Confucius Classrooms. The banquet was emceed by CI/SDSU Managing Director, Dr. Lilly Cheng. Deputy Consul-General Mr. Sun Lushan delivered a welcome remark to wish everyone a Happy New Year. He addressed that the Consulate Office would continue to strengthen collaborations between U.S. and China in 2017. San Diego County Supervisor, Ron Roberts, delivered his appreciation to the Consulate and CI/SDSU for their unrelenting support to the diversity in education and cultures in San Diego. Dr. Michael McQuary presented a plaque of proclamation to Deputy Consul-General Mr.Sun Lushan, honoring the Consulate’s achievements in developing education programs in San Diego. 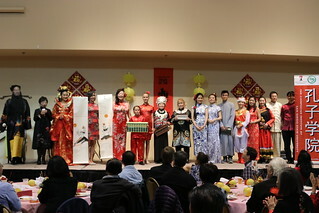 Performers from Hangzhou Opera and Ballet Theatre and Shaanxi Normal University provided entertainments for the guests at the end of the banquet. Yamaya Bruce, a Confucius Classroom student from Riverview International Academy, gave a welcome speech sharing her experience traveling in China in 2016. Her fluent Mandarin won rounds of applause from the audience. 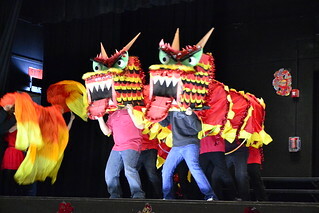 From January 30th to February 3rd, E3 Civic High School hosted its second series of Chinese New Year celebrations. Hanban teachers Ms. Yan Jiao and Xin Guan prepared dumplings, sweet dumplings, noodles and different types of Chinese food for the students. Students not only had the opportunity to sample various Chinese foods, they also tried on different Chinese costumes. In addition, teachers showed the clips of 2017 Spring Festival Gala from CCTV for students to enjoy Chinese New Year programs from China. On January 26 and 27, 2017, Confucius Classroom at Central Elementary School, in Banning Unified School District in Riverside County, hosted its annual Chinese New Year Celebration under the anticipation by parents and local residents. The celebration, hosted by Principal Marcia Cole-Anderson, was always a sell-out event. Over 800 guests each day crowded into the auditorium, Co-Director Professor of Confucius Institute at San Diego State University, Professor Cunlu Zhang; Project Manager, Ms. Anne Chu; Board members of Banning Unified School District were among the honored guests present to join in the festivity. Over 23 performances were creatively layout by Hanban teacher, Baohua Liu. Students and faculty members rehearsed for more than a month gearing for a perfect performance. Chinese New Year Dance “Kai Men Hong” (“A Shinning Beginning”) kicked off the program. Children’s songs “To Find My Friends”, “Counting the Ducks”, “Happy New Year”, “Song of the Fruits”, “Healthy Song”, and “Pulling the Carrot” all won rounds of applause from the audience. Each and every show was artistically performed and choreographed. 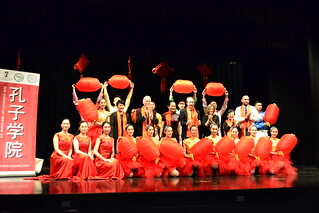 The grand finale showcased teachers gracefully performed the dance, “Blue and White Porcelain”, in their gorgeous Qipaos, which exudes the beauty of the Chinese porcelain. The Mandarin program has grown from non-existence in 2011 when Central Elementary School first was accredited as Confucius Classroom affiliated with CI/SDSU, to 32 classes and 2 after-school programs currently. 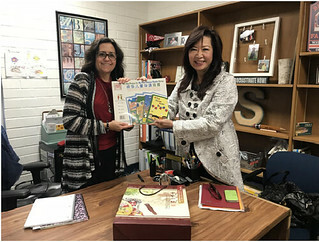 With the support from CI/SDSU, Central Elementary School has become the leading school in Banning to promote Chinese language and culture. On January 27, 2017, Chinese New Year’s Eve, staff members of Confucius Institute at San Diego State University participated in the “Hope: Poetry & Music” concert, a celebration of Eastern and Western music, poetry, and culture. The concert featured world renowned musicians, including George Maxman, Duan Aiai, Weicong Zhang, and Jessie Chang. Many popular traditional Chinese Music pieces were featured in the program, such as Chinese Butterfly Lover, Horse Rising, and Deep Night. Along with Western classics, such as Moldau and Ravel-Bolero, it was truly a feast for the ears for San Diego art aficionados. CI/SDSU aims to promote awareness of Chinese culture through participating in a variety of art and musical events. CISDSU Hanban teacher Ms.Wei Li, who teaches in Fallbrook Union Elementary School District, held a celebration for the Chinese New Year of Rooster at Maie Ellis Elementary School on January 27, 2017. Director of Fallbrook Union Elementary School District Lea Curcio was present to support the celebration. The celebration was divided into five parts: lantern making, lucky money making, Chinese character writing, Peking opera mask making, and dragon drawing. 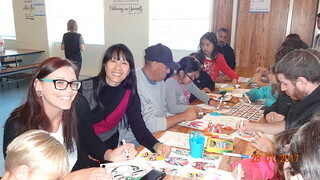 Parents and students worked together for different artworks. The dragon drawing was the most popular activity. Each participant drew their own part of the dragon, and wrote their best wishes for the New Year. Many students went home with red lanterns in their hands and Peking Opera masks on their faces. Parents had character writing in one hand and lucky money envelopes in the other. Over 100 parents and students participated in the celebration this year. 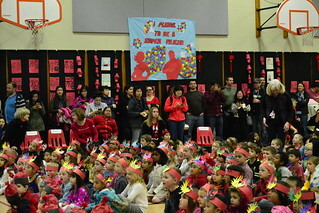 In the morning of January 26th, 2017, Adobe Bluffs Elementary School hosted Chinese New Year celebration. Confucius Institute at San Diego State University Managing Director, Dr. Lilly Cheng; Co-Director, Professor Cunlu Zhang; and Project Manager, Ms. Anne Chu, participated in this festive event. 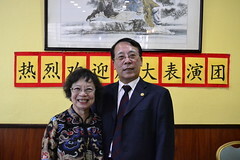 The school auditorium was adorned with many of students’ art work, including paintings of 12 Chinese zodiac, Chinese characters of ‘Spring” and “Luck” in Chinese calligraphy style, and paper-cutting, to name a few. Parents and other family members swarmed into the auditorium soon after the school opened its door early in the morning, they eagerly waited for the performances to start. Students from every classroom, pre-kindergarten to 5th grade, had prepared their individual show for the day; including popular Chinese children’s song, rapping, dancing and so on. The highlights of the show was the Chinese song, “Mo Li Hua” (Jasmine Flower), performed by 5th graders. But the grand finale, a very popular Chinese pop music, “Coolest Minority Tribe” performed by school teachers, brought the crowd to their thunderous standing ovation. Everyone enjoyed the celebration so much, they enthusiastically expressed their eagerness to participate in the festivity next year. Adobe Bluffs Elementary School was accredited to be the newest Confucius Classroom affiliated with CI/SDSU in November 2016. 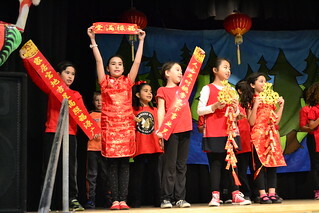 The marvelous Chinese New Year performances presented the remarkable progress students had gained in their Chinese proficiency within only 3 months of Chinese learning. Dr. Lilly Cheng was invited by the San Diego Rotary club to give a talk on the topic of “East Meets West”. This event took place at the Liberty Station Conference center on January 26, 2017. The focus of her talk was on the Chinese New Year and the traditions of the lunar calendar. She explained the differences of the explicit culture of the east and comparison of the eastern explicit culture to the western culture. This year’s Chinese New Year – the year of golden rooster—falls on January 28, according to the Chinese lunar calendar. It is a time for reunion. 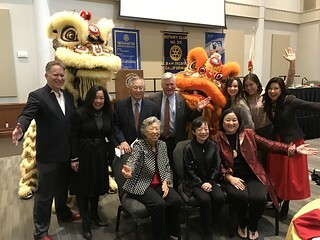 On January 21, House of China and Chinese School of San Diego co-hosted the Chinese New Year Celebration & Fundraiser Banquet at Jasmine Seafood Restaurant. CISDSU was proud to kick off the celebration with our Confucius Six Arts performance. The Six Arts Performance featured a Chinese tea ceremony, music, archery, leadership, calligraphy and abacus. Managing Director of CISDSU, Dr. Lilly Cheng, introduced the six arts ambassadors. Justice Bao, a famous Chinese judge from Song Dynasty, started off the performance with a Chinese musical instrument “Gong”. The loud, resonating sound of the Gong symbolizes the way that Chinese people welcome the New Year. Empress Wu Zetian, the only Empress in China’s history, went on the stage with her gorgeous red imperial gown, which immediately caught all the attention from our audience. Tea, calligraphy and abacus ambassadors graciously presented to the audience their beautiful tea wares, calligraphy scrolls, and abacuses. CISDSU teachers also showcased their talents in performances of Guzheng, Mongolian dance, and Kung-Fu. CISDSU Co-Director Cunlu Zhang demonstrated Tai-chi, which won a round of applause from the audience. Over 300 community leaders and local members attended the event, including Chief of Staff of San Diego County Supervisor Ron Roberts and Salvatore Giametta; School Board President of San Diego Unified School District, Dr. Michael McQuary; President of House of China, David Seid. The Emcee for the evening was Michael Chen from 10 News. On January 16th and 17th, 2017, E3 Civic High School, one of the Confucius Classrooms affiliated with Confucius Institute (CISDSU) at San Diego State University, celebrated the Lunar Year of Rooster. Four Hanban teachers introduced Chinese traditional customs, Chinese zodiacs, and New Year wishes to the students. Through key lectures focusing on origin of Lunar New Year customs and folklore stories, students learned more in-depth knowledge of the diverse Chinese culture and the meaning of the Rooster year. 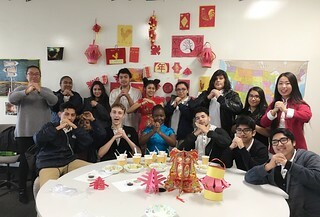 These Chinese New Year celebration enhanced students’ interest of Chinese and Chinese culture, and they thoroughly enjoyed the Chinese New Year celebration through different activities. To decorate the campus, students designed art work with the theme of “rooster”, such as Chinese calligraphy tablets, holiday greeting cards, lantern paintings, paper-cuttings, making red envelopes and many other rooster craft works. The festivities in Chinese New Year theme provided an optimal opportunity for both faculty and students to experience the profound beauty of Chinese tradition and culture. On January 17th, 2017, delegates from Guangzhou Academy of Education visited Confucius Institute at SDSU. Guangzhou Education Academy is a research institute which focuses on China’s K-12 education, special education curriculums, and assessment research. CISDSU Co-director Cunlu Zhang welcomed the delegates. Prof. Zhang introduced CISDSU and its “Six Arts” program in Confucius Classrooms. CISDSU Confucius Classrooms are excellent models for combining American and Chinese education in grades K-12 which have been proven effective. Later, two SDSU undergraduate students from Guangzhou joined the meeting and shared their study-abroad experiences. With a growing Chinese student population studying in the United States, CISDSU also strives to create opportunities for American students to go to China.